Winmate has developed an automotive grade TFT-LCD for in-car application, allowing the touch panel to serve many applications, depending on the selected user mode (activated via the buttons to either side of the LCD). This monitor is compatible with NTSC/PAL and equipped with 1x VGA input, 2x video inputs, 1x audio input, OSD controller and infra red (IR) remote controller. 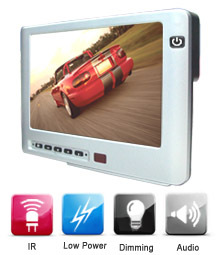 The monitor is designed with hot key functions to adjust the brightness easily. The build in resistive touch can be connected to any car PC by USB and support your application. 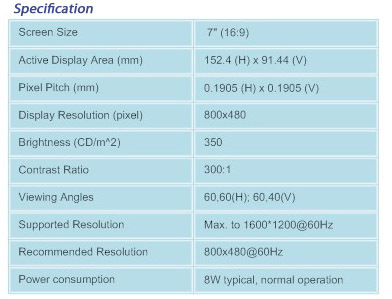 The mechanical design of W07T740-AMA2 is small and light, the exact dimensions are 196*130*35 mm and it weighs only 560g. The product combines many functions required in the car environment, and it is the best choice for special applications, like Car GPS, car media players and car safety electronic systems.